The debate about intensification has come roaring back to life in the last day or so following a beat up by Bernard Orsman in the Herald about the unitary plan process. 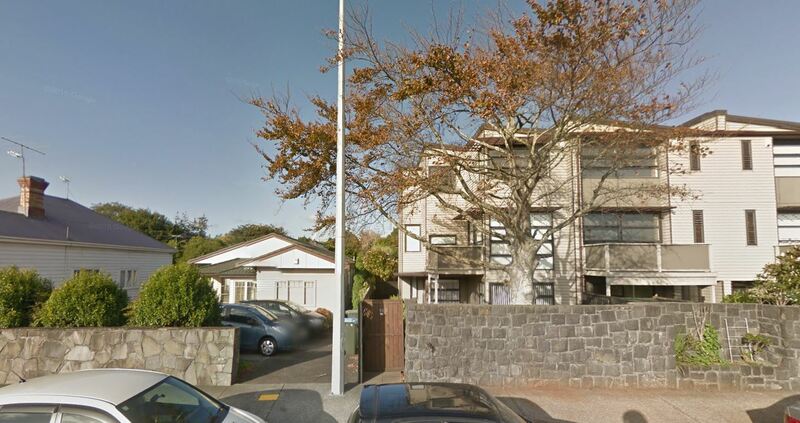 Tens of thousands of homes in Auckland’s leafy residential suburbs are being rezoned for multiple townhouses and apartments and Auckland Council says homeowners will not be notified about the changes. 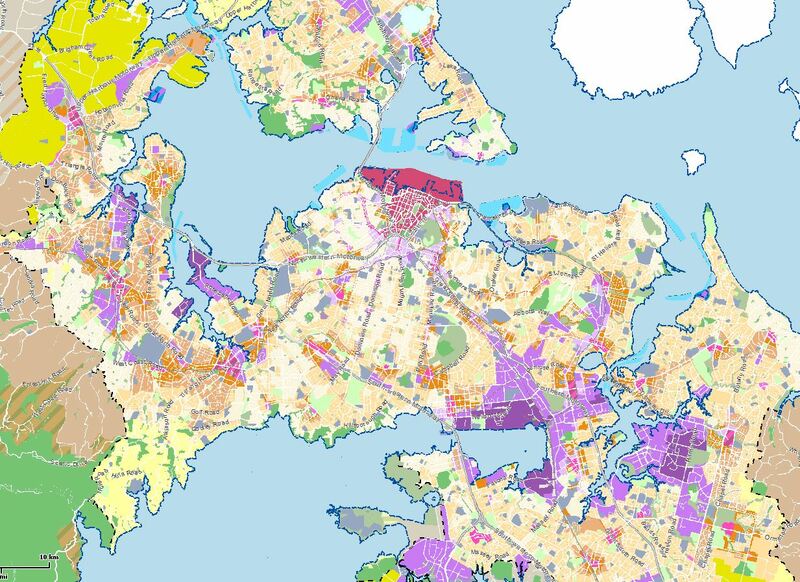 Tomorrow, the Unitary Plan committee will meet behind closed doors to approve changes to the single house zone in north, south and east Auckland. This follows a decision by the 11-member committee on November 10 to approve changes to the zone on the Auckland central isthmus and West Auckland. The council has rewritten the rules for the “single-house zone” where one- and two-storey houses are typically set amongst trees and gardens. New rules mean tens of thousands of houses no longer qualify and will be rezoned to a “mixed-house” zone to allow for townhouses, studios and apartments of up to three storeys. Are we really down to the stage of scaremongering about three storey townhouses, a housing typology found frequently overseas and even in many parts of Auckland already? In fact for a city like Auckland three storey townhouses are perhaps the ideal missing middle of the housing. On top of being fairly spatially efficient they can be built in existing suburbs and not look out of place as they’re often no higher than a two storey house with a pitched roof. They’re also generally cheaper and easier to build than apartments as they don’t require expensive features like lifts or complex sprinkler systems. So what’s really happening? The answer is much less secretive and much less alarmist than the herald like to make out. The Proposed Auckland Unitary Plan (PAUP) was notified by the council in 2014 and since then an independent government appointed panel (IHP) has been going through the almost 10,000 submissions and supporting pieces of evidence submitted by the public and the council. The IHP will eventually issue a recommendation back to the council on the PAUP based on the submissions and evidence and that is almost certainly going to be different from what the council originally started with. Along the way the IHP have been challenging the council on various topics and also issuing interim guidance on issues such as around the levels of heritage protection and viewshafts. As part of the process the council have been required to consider rezoning changes which is exactly what they are doing based on what’s happened so far it’s what’s likely to happen based on the interim guidance issued so far. I know I’ve skipped a lot out but kind of brings us roughly to where we are today with the council are looking at better defining where development can occur. From what I’ve read it seems they are looking at expanding the mixed housing suburban and mixed housing urban boundaries. It seems to me that a lot of the angst in the article probably originated with the 2040 group who have long opposed much of the intensification planned. As a result of this the interim guidance my guess is they’ve been seeing the writing on the wall that more intensification would be allowed so they’ve complained to the Herald. The real betrayal of young people is by those who have opposed any change to the city, especially in the area of housing where prices have been pushed up or some people have been pushed out half way to Hamilton. Of course many young people would live in an apartment or terraced house if more were able to be built to bring prices down in the areas they want to live. Part of the reason for this is often they are quite different from their parents in that they don’t aspire to a house in the suburbs where driving is the only option and they have to frequently do things like mow lawns and manage gardens. As for driving, well Auckland Transport have already said they’re looking at building a light rail network across the central isthmus which will help in moving lots of people without suffering from congestion. Disappointingly it also appears that new mayoral candidate Phil Goff is starting to go down the line of backing off intensification in some areas. Stu has more on this in a post later today. It will be interesting to see what the council come up with in terms of rezoning. Ideally the ishmus would look much more like West Auckland in the map above with a lot more mixed housing urban allowed (3 storeys). I’m sorry, but Orsman is a disgrace to journalism – he has waged a completely unprofessional and inappropriate vendetta against the elected mayor Len Brown ever since Brown took office on the strength of a perceived snub at a council reception, and he doesn’t hesitate to click-bait rabble rouse and agitate against the council on behalf of the established moneyed interests like the 2040 group that he clearly thinks are the last bastion of Herald subscriptions. As long as he remains at the Herald the chance of any responsible and informed local reporting on theses issues in the cities only newspaper is close to zero. I sent Orsman and email saying i was unhappy with his sensational, largely one-eyed approach to local government matters. I also said his writing was one of the reasons I refuse to subscribe to the NZ Herald. I won’t pay for propaganda. Stories like this will be intended to create the atmosphere into which whoever is mayor must walk….and the Herald wants to shape that agenda well before election day. It’s the “free speech of foreign billionaires” we enjoy in New Zealand, thanks to the gross over concentration of media ownership we have allowed here. Unfortunately, efforts to correct the work of people like Orsman are only effective with the tiny minority who actually pay attention to a variety of voices. Yeah my angry letter is out as well. In the category “I can’t believe I actually have to write this”. Probably the most dissapointing thing about the article is the fact that the most central single house zone areas on the city fringe are not listed as being reconsidered. Agree, this would be the most sensible area for redevelopment to occur. A couple of streets could be saved in a museum like state for heritage reasons. I quite like mwfic’s suggestion on an earlier post: If Aucklanders want to protect heritage, why not pay Dunedin to protect theirs? Seriously, Dunedin has way nicer heritage buildings than Auckland. It’d be cheaper too, because there’s less development pressure there. I think every city where people like the heritage had two things occur. 1/ an economic boom that let them spend outrageously on expensive buildings- followed by 2/ an economic decline as business went somewhere else but left the old buildings immune to redevelopment. Look at Florence as the best example. Exactly right, Charleston SC, is the poster child for this. The end of slavery ended its economic cause, built out of stone, pretty much sat there till late last century. you can say that for most of Italy apart from Milan. Yes indeed. That’s one of the reasons I’m interested in built heritage and the politics and economics of heritage preservation. It’s a topic that combines so many of the interesting things that happen in cities. Economic growth and decline, social change and inequality, aesthetic preferences, etc, etc. nothing to see here. The Herald doing what the Herald does. A suddenly erected 3 storey property next to yours that blocks the sun and impacts your privacy is very much unwanted. Before the usual nimby name calling nonsense comes out, ask yourself how you would feel if a new property erected next to yours gave the new neighbours free and open view into all the rooms in your house and blocked the sun from your garden. Doubt any of you would wish for that. The question we should be asking is what population and intensification is enough? Where does it all stop? Those are the real questions. What price do you place on the destruction of the positives of our so called ‘livable city’? Is it cram people in no matter what or is it lets keep what makes Auckland attractive and not give in to endless pressures to house even more each year. Please don’t call endless population growth ‘progress’. It isn’t. – move to the countryside. That’s why the Big Bang created so-called “rural areas”. By the way: when did NZers become such a bunch of useless nanny pandas that they can’t sort things out for themselves? Newsflash: The world cannot stop turning simply because you want your privacy protected. Why don’t you protect it yourself rather than being a whining sack of spuds? Oh sorry, that was name-calling I take the last sentence back. P.s. Where does the population growth stop? Well, my mum once told me it was when consenting adults decide to stop procreating, ie. the game formerly known as “hide the sausage flat”. Might want to check the day light and height to boundary rules there RB. Height to boundary and coverage restrictions still exist. And as for light, designed right, there are no issues. Privacy? Put some sheers in. Edit: I see others have also said the same things. Oh, I live in a medium density development. No lack of light. Privacy is no issue. If you travel around the world (literally or in google maps) you will see that three storey buildings can be private and allow sunshine in while allowing for greenery and public transport, etc etc etc. A city has to grow upwards at some point. I live in a block of apartments. Our living room window is 5.5 metres away from our neighbour’s living room window. (I measured the distance!) A few decades ago some clever buggers planted a row of trees between the buildings, which means that we’ve got privacy and a nice leafy view. In other words, there are ways of dealing with this. The options for capping a city’s population involve economic failure (a la Detroit), violations of human rights (due to the need to control births/deaths and prevent internal migration), crazily spiralling house prices (due to artificial restrictions on supply), or some godawful combination of all three. I would argue that these options are less desirable than allowing more intensive development where there’s demand for it. I cant give you an exact figure but I can say that there are exactly zero world class, livable, vibrant cities in the world that are not growing. Auckland is growing too and it’s time to grow upwards not outwards. If you don’t like it, you’re free to leave. This has already happened in many cities around the world….and all the large ones. What happens is the now-shaded homeowner sells up and another building gets erected…..to block more sun…….so those people then sell up…..and so on. It’s just how it goes. Better to leave the now-shaded house and move into one of those larger apartments – on the top floor – with a lovely wide view over the area. Preferably facing a street, so the nearest building is at least across the street. I can’t see any way of stopping this as long as people refuse to connect growth with such consequences. People who don’t want to lose their sunlight should have no more than 2 children and vote for parties that severely limit immigration. Otherwise…..prepare to sell up and move. You (as in ‘one’) voted for it personally and electorally. (Whether you realise it or not). RB are you aware of height to boundary and boundary setback rules that apply? Which provides for sun access and privacy. One thing you could do is review what impact occurs on “your” sunlight and privacy if your neighbour suddenly erected a building to the height to boundary limits under current rules. Then review your concern. And just to add to the outrage – The Herald on-line today has this story illustrated with a collection of high rise CBD apartments. It is not just Len Brown that BO has had his knife into. His record with any non-C & R type Mayor or Mayoral aspirant is similar. It’s a simple rule- you can be right but it’s not much use if you can’t convince others. You have to go back to David Kirkpatrick’s patented two rules of town planning: 1/ I can do anything I want with my property; 2/ My neighbours can’t do anything with theirs. 2. Then complain about Council/RMA red tape. That’s the problem in a nut shell. A few years ago our Council arranged what they called “Charrettes” on the new City plan and I went along as I didn’t want any changes to the area I live in. But was well and truly put in my place. THe whole effort was to intensify the population within walking distance of the sentre. It all made sense and as a result lots more that 2000m² were able to have a dwelling per 120m² and 1200m² were deemed to be 4 sections for rating purposes which drastically altered their values. TI will lead to intensification but over a period of time as people like me die off. It seems to me the intensification people are making the same PR blunder the motorway builders made in the early 1970’s. Back then they would publish a centreline and were allowed to build a motorway anywhere within 1/2 a mile either side, so the upset thousands of people rather than hundreds. Eventually their fun came to an end with the Central motorway through Mt Eden. Maybe if the Council zoned the areas around the CBD and left the rest of Auckland’s centres out of it this time round they would get it through. Who cares if St Mary’s Bay, Ponsonby and Herne Bay are intensified? I have met people from those areas and I would march in favour of bulldozers! I don’t completely disagree but the areas you’ve identified are too small. We’re talking about 700,000 odd people that need homes over the next 20 years. Largely from natural increase too, so it’s not just about migration. I’d suggest everywhere in the central isthmus, plus the town centres of new lynn, hendro, westgate, takapuna, manukau, and botany. And we need to err on the upside: If NZ Inc is more successful than anticipated then we could get more people wanting to live here and/or more babies, hence I’d suggest working towards the high population growth scenario. Crikey! They will be warming up the tar and ordering feathers off ebay right now for anyone who suggests that. What’s this about hot sticky liquids and feathers? I think you’ve mixed up TransportBlog with SordidRedHeads.com. Part of me wants to click that link… Most people don’t care about planning but they care about the price of the house they bought. Yet planning law excludes the very thing they care about from consideration. So they suddenly care about heritage or character or traffic or the viability of a nearby centre they never actually visit or something that they can use to protect their value. Sprawl has always been easier because in most cases the neighbours want it too. But the centre needs more houses so why not start there and win some battles rather than grand schemes that upset everyone. As for the villas, just load them onto trucks and park them on new sites in new suburbs. Most can be recycled. That’s a brilliant idea, we can create a heritage surburb in the burbs. Of course current single house zone planning rules means they’ll be on much bigger sites than they came from. 1. Development has both pros and cons, and there’s no reason to expect the cons to be consistently larger. Consenting processes often focus on negative effects – e.g. added traffic on local roads, overshadowing, etc – while paying less attention to positive effects – e.g. agglomeration in consumption and public service provision. Personally, I think that imbalance is a good reason to rewrite zoning rules to be a bit more permissive – as I’d expect consent processing to focus more on the downsides of growth. 2. Planning rules almost never _require_ people to develop intensive housing. (Although they frequently prevent them from doing so.) It’s inaccurate to say that council is planning to build high-density dwellings in leafy suburbs – what they’re actually doing is _allowing_ people to do that if they would like. Liberalisation of planning rules gives property owners more choice, not less. If people want a house on a big lot, they can still have that. Choice is usually good! Psychotic drivel aside, the neighbourhoods you mentioned aren’t the key ones for intensification; those near the CRL and stations are, that’s the whole reason we’re building it right? Orsman should stop putting out that he is actually a journalist but a fully paid up propagandist for Citizens and Ratepayers / Auckland Future. I don’t understand why we are talking about destroying leafy streets. Almost all of Sandringham Road is full of largely nondescript and sometimes poorly maintained single houses, and two deep. There’s already one Ockham block opposite Eden Park. Dominion Road has quite a bit of that too. We can fit so many more people in, right on these transport routes which are already excellent and will get better, and the rail stations will be just a short LRT ride away. Surely this comes before developing in pretty side streets that people love? I don’t understand why Orsman is putting that spin on it either. As you point out, most of the areas being upzoned (e.g. bits of Mount Eden) have good transport access and there’s no reason to believe that the occasional three-storey development will destroy any leafy streets. Um ever since the daylight controls were introduced? But 1/4 acre Northcote like 330m2 Kingsland were largely built before any such controls. 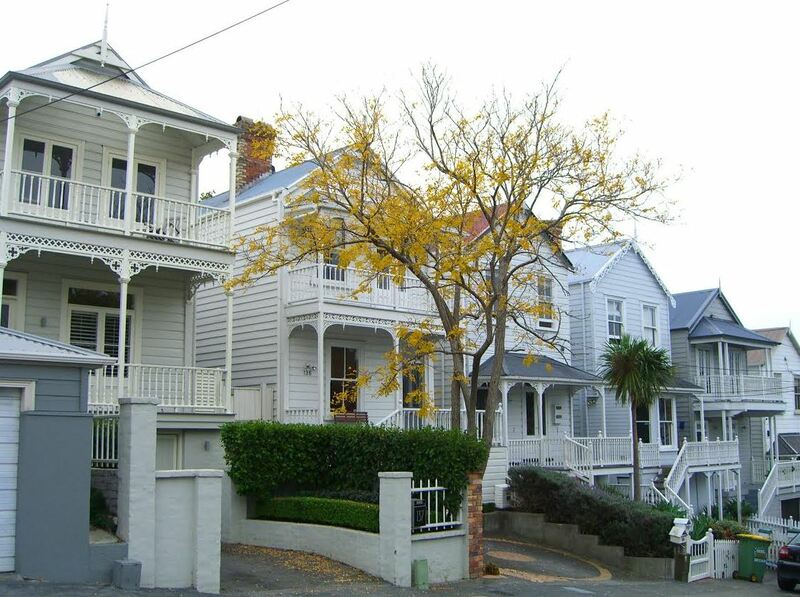 My Kingsland neighbour’s house was built right on the boundary in 1905 – all two levels of it. Fortunately it is to my south and as the slope continues to go up, they overlook my roof. Yes but the controls still apply. Except the neighbour built on the boundary can claim existing use rights and continue to not comply with the rule. But anywhere on their site they could comply on the day the rule came in then they have to comply. Same if you pierce the daylight envelop, you can continue to not comply if you didnt when the rule came in but you have to comply on the boundaries or parts where you did comply. I get the feeling the best planning can be done with just a map and a compass. Draw a 5km circle around the city and a 1km circle around each train station and designate them high density. The current unitary plan doesn’t seem to make a lot of sense and seems a bit unfair on certain segments which are high density while their neighbour is low density (depending on which you want to be). Ooh, there goes all of Ponsonby and St Mary’s Bay. You may soon find out if torches and pitchforks are still part of the heritage character of that area. I’m with the urbanists, but I’m a bit concerned by the combative tone of some of the comments. Remember, journalists write to please their constituency. I’m sure there are plenty of people in the burbs who would be horrified by the picture above from Epsom intended to be an example of good redevelopment. We should be trying to get through to them. According to the Journalist Code of Ethics published by the EPMU, the umbrella union for the profession, “Respect for truth and the public’s right to information are overriding principles for all journalists.” Playing to the prejudices of some readers does not come ahead of that. More specifically, the EPMU states that journalists “shall report and interpret the news with scrupulous honesty by striving to disclose all essential facts and by not suppressing relevant, available facts or distorting by wrong or improper emphasis.” In my view, Orsman has failed in that duty by failing to report on the full context for the Council’s proposals. That being said, I think your recommendations about language are excellent and I try to take a similar approach. “Intensification” does have negative connotations for many, as does “sprawl”, but it’s a bit hard to find another word which describes it snappily. We often talk about ‘housing choice’ but that’s two words not one! That’s not at all what’s proposed here. That’s high-rise in the CBD (I guess). So even if that journalist was “writing to please his constituency”, he’s still not supposed to flat out misinform people like that. Wouldn’t the simplest solution be for developers whose development causes a loss of utility to other property owners to simply recompense those property owners. I.e. my new development creates congestion, shading, noise, I write a cheque to the neighbours for $15,000 a year for 10 years or whatever. Now it may well come up that this makes new developments uneconomic, but that’s simply because we are including costs we would otherwise ignore – exactly the same allegation levelled (rightfully!) at road construction that ignores externalities. Or you could argue the other way – that those against density should pay the ongoing costs of limiting land use (such as infrastructure for sprawl). Maybe a $5000 P/A targeted rate for everyone in the single house zone? Well, no, because if I currently enjoy X utility, you can’t just take it off me. Ownership rights supercede some sort of vague future potential. If, as you are suggesting, the development will actually create more overall utility, then you can slice off some off that excess utility (profit!) and give it to me. In basic terms, I’m selling you my utility (raw material) for you to build a new development (finished product). Either there’s enough to pay me back, or there isn’t. If I don’t get paid back, then you as the developer are profiting from my loss of utility. In my mind, we could get rid of all zoning, just keep heritage and greenspace protection, but make sure developers have to recompense for loss of utility. Congestion isnt a real effect, it is simply an artifact of unpriced road use. Same with parking. Not sure where you are going with noise – everything is already zoned residential. AFAIK there are no permitted noise generating activities associated with that zoning. So any noise is not governed by the land use consent and is subject to noise policing like everyone else. Shade I agree with but the problem is the RMA does not allow for this. Subject to noise policing, yes, except that having to call the noise officers to stop noise is less preferential to no noise in the first place. Congestion doesn’t just mean drivers btw. It could mean more people on your footpath, more people using your bus etc. There are always negative effects of our actions on others. If I was a judge I would throw you out of my court pretty quickly if you started arguing footpath congestion. You seem to think there isn’t noise in the single house zones. I live in one. People have parties. They sometimes go late. It’s all part of life. I lived in the city for many years in a well built apartment and never had any issues with noise. It is true that sound is an inverse square function. It is also true that different building methods reduce sound better than others. In my own experience the most intensive place I have lived was the quietest due to the soundproofing included, whereas my current villa has single glazing and minimum insulation in the wooden walls. I’m also intrigued by Matthew W’s comment that overshadowing can’t be considered in an RMA context. What’s the source for that? If and only if frequency changes. If I currently have an 8am bus with 15 people on board, and that changes to an 8am bus with 55 people on board, my utility drops. I wasnt saying ovreshadowing cant be considered, I was just saying that the RMA does not provide a mechanism for Coasean type compensation. It either lets you do something or not. Sometimes consent conditions look a lot like compensation (skate parks for example), but there is no mechanism for cash to change hands. Ah okay – that has much less exciting policy implications. Thanks for the clarification Matthew. I’ve been thinking lately about the potential for replacing planning regulations with Pigouvian taxes. That’s obviously got both legal challenges (no legislation enables it) and empirical ones (how do you choose the tax rate?). But on the whole, it seems like an idea that has merit and which may be worth pursuing. The question here is: if you build your house with that view, or that privacy, are these things considered transient, or do they become your birth right? Both sides of that discussion probably have some good points. For instance privacy. True, townhouses probably afford less privacy than freestanding houses. And 3 storeys is high enough to look over the neighbour’s garden. But infill housing has the same downside, and has happened in a lot of places. I’m also not sure where that desire for privacy came from, and if it’s such a good thing. Large areas in the suburbs have streets where you just see fences on both sides, making it look a bit like a ghost town. We definitely need some discussion about weighing this privacy and heritage and character, against how harmful it is for a city to enforce an ultra-low density collar around the city centre. Great questions! I especially think you’re right to highlight the potential for negative unintended consequences. People seem to feel safer in areas that have some “eyes on the street”. But people also value visual separation and privacy. Planning regulations trying to address these issues often seem to be walking a fine line between addressing different externalities. In this context, I wonder whether there’s a bigger role for non-regulatory solutions. Take the oft-derided Hobson and Nelson St apartments. Rather than trying to discourage them by regulating apartment sizes, why not put a targeted rate on them to fund upgrades to the streetscape and new paintjobs for the building exteriors? That seems like a win-win solution. Even without a targeted rate, one of those blocks generates a lot of rates for a small piece of street frontage. • Other things, which have nothing to do with apartments. Like traffic noise (hello again, Police), the deadbeat pedestrian phasing at traffic lights, and just generally having a motorway on-ramp at your door. A developer can’t do much about these, but they also reflect very badly on the idea of living in an apartment. One thing not on that list is the size. It’s not like those apartments are only being rented out for scraps, far from. You probably pay more than $300 pw for a 40m² (and sometimes much smaller) apartment. Anyone arguing for larger minimum sizes is completely missing the point. A lot of rates, I have often thought about calculating how much a building like Zest pays in rates in return for a small street frontage on a pedestrian unfriendly road, no rubbish collection and the joy of listening to every police siren in Central Auckland. You can’t put ugly in a building code but there are things in there to try and limit it (no washing on the balcony, most body corps have rules about reflective window treatments). By the way a 2 bedroom in most of the Hobson ridge buildings (just under 40 sqm with tiny balcony) will currently set you back $400-480 per week in rent (carpark $50-60 a week extra). Views are not protected in general, just some specific ones by view shaft rules. Privacy isn’t usually either but daylight rules and max height rules sort of do it but they were intended for other things. You can have privacy and higher density. Terraces have both as everyone looks out the front and back and has living on the ground. That is much more private than a single house if the dumbass neighbour puts the living upstairs. And forget 3 stories – it should be 4-6 storeys so we can get some proper densities and some proper economies of scale. This would allow Council to impose some stricter design guidelines on developers, who could still make a profit due to the extra floors/density. Yes, individual property owners will be upset to find their house now backs on to a high density zone but we can’t make an omelet (affordable housing) without breaking a few eggs. Here are some pics I snapped in Brooklyn, NYC last June. Just compensate those individual property owners. Done. If there isn’t excess utility generated by the additional housing sufficient for compensation, don’t build them in the first place. What are you compensating them for? Do you think you should be compensated every time your neighbour decides to build something on their own land? Should you also be compensated if your neighbour wants to buy a second car? That will add to congestion. Or if your neighbour decides to have children, that will add to noise levels and you should be compensated? And aren’t they already being compensated by the fact that their land will be worth a lot more as high density than as low density? If my building something on my land causes harm to you, then yes. I can’t shine a foglamp at your window, can I, even though the only thing travelling across the boundary are photons. As for MikeM’s comment – if you can prove an uplift, sure, but a single apartment block in a street of “leafy properties” will not cause an uplift at all to neighbouring properties. That foglamp example is entertaining but doesn’t really help your cause. Individual photons are intangible but their brightness definitely isn’t. If I call up Auckland Council because you’re keeping me and my kids awake with amateur lighthouse keeping, a Council officer will be around with a light meter to confirm whether your foglamp exceeds the legal nuisance level (10 lux at night). If it does, you’re going to get an abatement notice to turn the lamp off or reduce its output. Excess artificial light (at both day and night) is a clear and obvious nuisance that can be measured by an objective observer and required to be brought down to a non-harmful level. The same goes for noise, fumes, noxious odors etc..
I’m struggling to think of any genuine, permanent harm to neighbours that isn’t already captured by law or bylaw but which is still measurable enough that an objective observer could reasonably put a dollar value on. You’re left with emotional harm or loss of childhood nostalgia – can’t wait to see how that would play out in Environment Court – or changes to property prices, which would be barely less of a crapshoot given the myriad factors that can affect them. Where are the rights to these things you want to compensate them for enshrined? Certainly not on the title to their property. If the single house zone is oroblematic, leave them alone and concentrate on the transport nodes and wherever else the residents are keen. Only don’t limit it to 3-6 storeys. Go for higher to compensate. Yup. 7/8 stories on Dom Rd, Gt North Rd, and 50/60 in the City, similar in Takapuna, then the more valuable single house zone areas can sit and keep being bid up by the older wealthy. But not the post war suburbs, what’s the point? Surely these can take the 3/4 story typologies, terraces, character apartments. I live in a Victorian street that because it was always mixed use had its commercial parts that have been turned into terraces and apartments; has done nothing but enhanced living here, is now rich with amenity, even as the big single house empty out and become largely unobtainable. What does age matter. Post war suburbs can have as much character and heritage as pre war ones. Eg Chatswood. It’s all in eye of the beholder. My point being let apartments be built where they are of the most value. Which will, among other places, be per war city fringe suburbs. Yes and no, ‘where they are most value’ really means on Transit nodes, for which Chatswood doesn’t apply. As we know the isthmus has relatively even mid density, and the addition of mid rise [4-7 stories] along Dominion and Sandringham Rds will lift the average density of these areas more than adequately, and offer a variety of price points and dwelling sizes to the market. In as much as the regs will allow, of course. We don’t need blanket upzoning, simply the addition of new peaks of density along the arterials, which, certainly on Dominion is low architectural value commercial and residential buildings. Some great subtle language in Bernard’s piece – 2040 is a “community group” whilst Generation Zero is a “youth lobby group”. He only uses ‘youth lobby group’ because he’s not allowed to use ‘Green Taliban Hitler Youth’ by his editors. As I said before, anyone can can themselves a journalist. However, the same can’t be said for electricians, plumbers, even steam boiler attendants. For those jobs you need real qualifications, and the fines are horrendous for any employer who allocates a job to an unqualified person. By the way, I personally have nothing against three storied buildings in the so called leafy suburbs, as long as the buildings have architectural merit.